We attended the For Inspiration & Recognition of Science & Technology (FIRST) Robotics Competition this weekend at the Javits Center with our good friends Matt, Jocelyn, and Yuri. 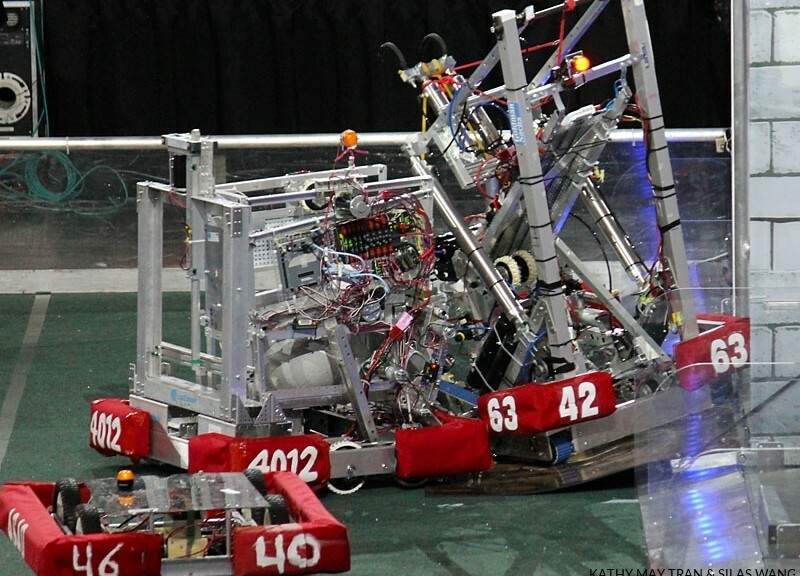 In this challenge, high school-aged students from all over the world have six weeks to design, build, and program stellar robots and then bring them to competition. 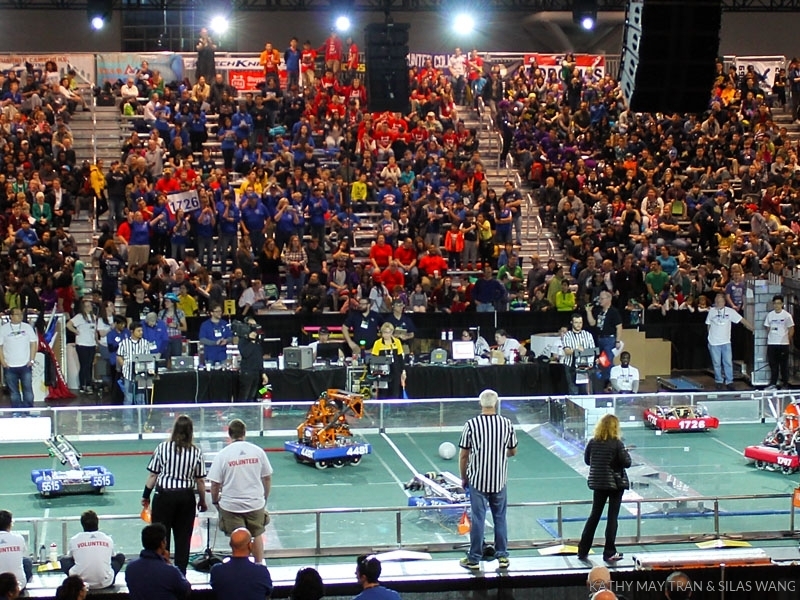 The New York City Regional featured 200 teams from the New York tri-state area, Brazil, China, Ecuador, Turkey, the Netherlands, and the United Kingdom. Winners at this level advance to the global competition. The atmosphere in the arena was thrilling – booming music, suspenseful BattleBots-style announcing, and fans and press everywhere. The stands were jam-packed with cheering spectators, with included the general public and applauding sections for the individual teams. 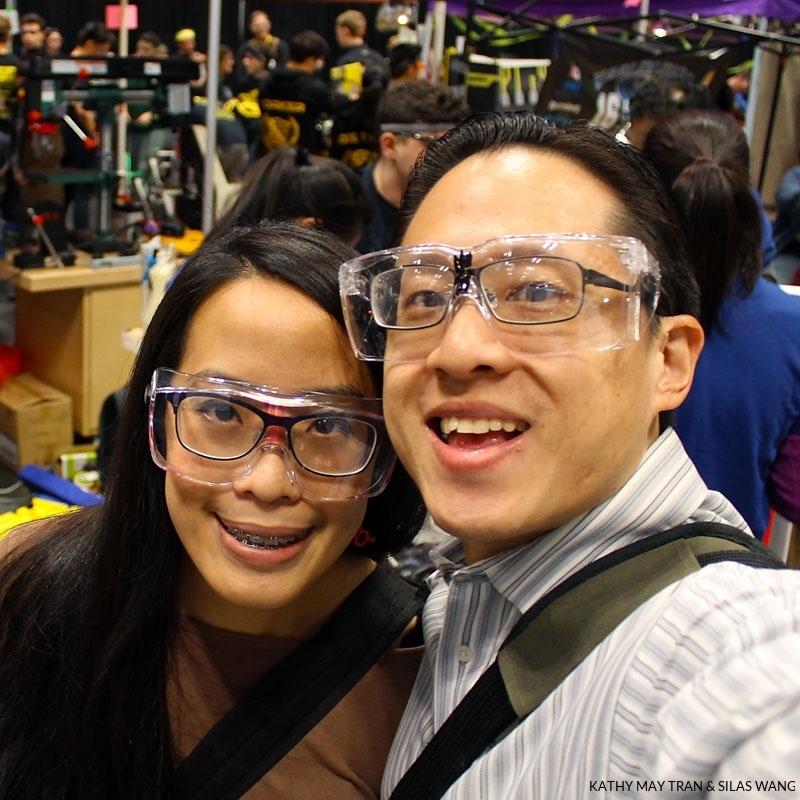 In between watching matches, we donned safety glasses to tour the Pits, which was the staging area for the robotics teams. 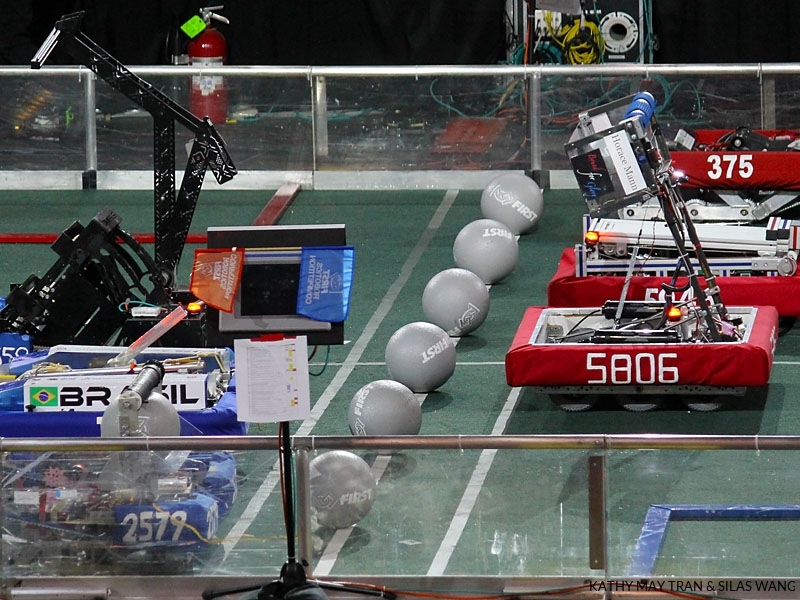 Here we got an up close and personal with the robots. The student engineers were excited to share their hi-tech strategies and talents with us and especially Yuri. We met a number of extremely intelligent and impressive young folk who explained the electronics and mechanics of their machines, as well as how FIRST Robotics and technology in general impacts their lives – in past, present, and future. 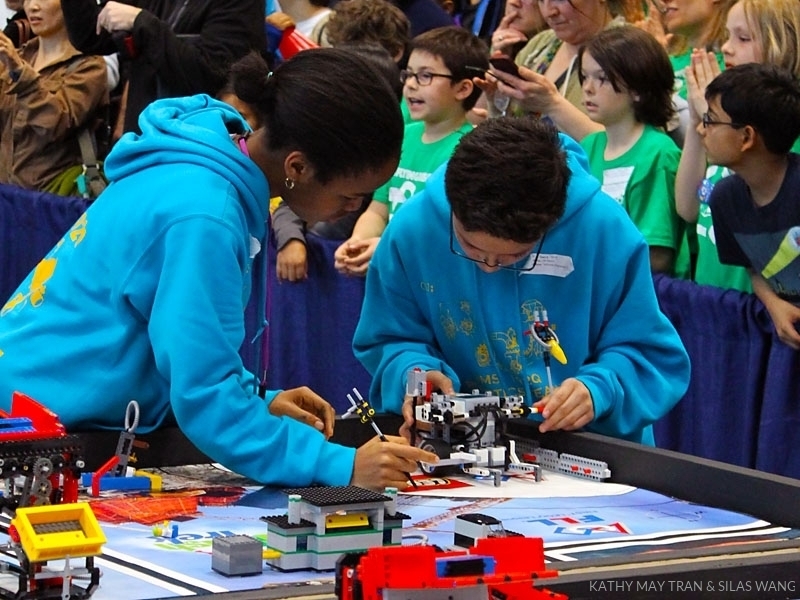 In addition to the high school robotics competition, the FIRST LEGO League Championship also took place at the Expo. Featuring 80 middle school teams that were selected from 190 teams across NYC, the LEGO theme was Trash Trek. The challenge was to build and program a mini-robot using LEGO MINDSTORMS to carry out prescribed tasks. The tasks of the challenge simulated solutions to environmental issues – reduce, reuse, recycle, and store. As you can tell, there was plenty of fun, excitement, and learning for all of us, regardless of age! Yuri met a larger-than-life walking, talking, interactive robot. He cheered on his favorite robot in the battle arena and then visited the Pits, where he received a personal tour of the workings of champion bots by their makers. He even participated in a scavenger hunt, won a Rubik’s cube, and solved it on the subway ride home! 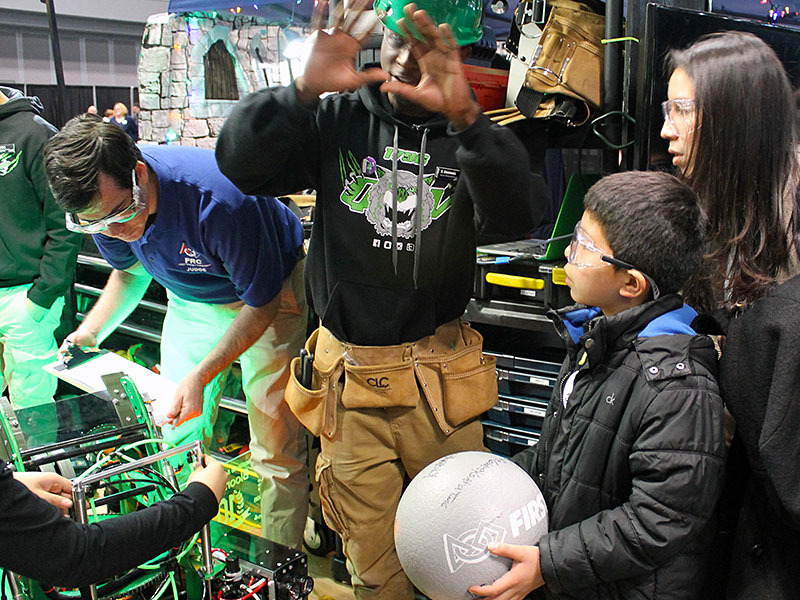 We thoroughly enjoyed the FIRST Robotics Competition as spectators, and it is impossible to have that experience without realizing what an exceptional challenge and opportunity the FRC is for students. 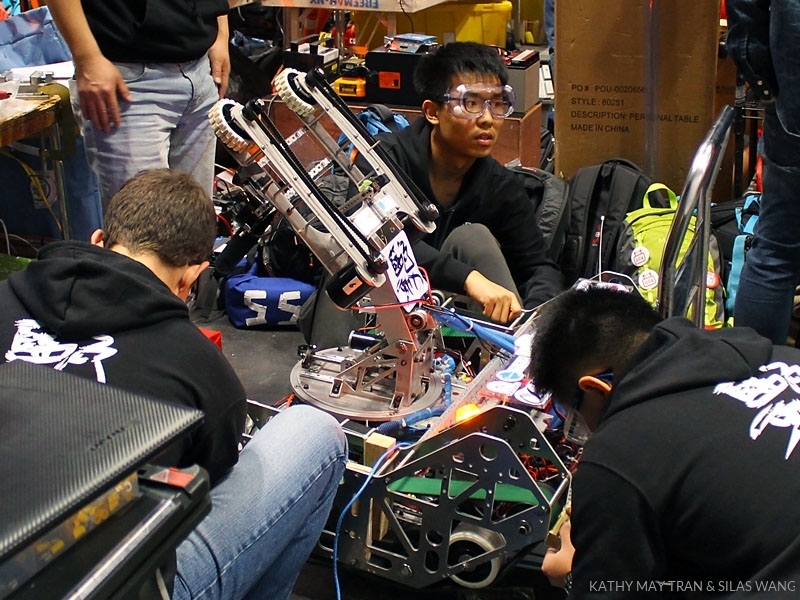 Not only do the teams and competitions provide technical instruction and experience, but also they are an opportunity to creatively problem solve in teams, to network with peers and mentors and professionals, and to be enthusiastic about maker culture. FRC has a long-term impact in the form of scholarships, leadership roles, and exposure to practical skills versus higher education. More important than the concrete opportunities are the intangible impacts: FRC and programs like it can instill confidence in knowledge and personality in youth. Here’s to hoping that kids like Yuri and these robot makers change the world for the better!